Sibling rivalry is real for Sadie and Erik Bjornsen. They push each other to ski better -- and train harder. They shared a killer strength workout they do together. Kikkan Randall had everything -- a long-awaited Olympic cross-country skiing gold medal in Pyeongchang, a family life with her husband and toddler son. And then she had breast cancer. After FIS President Gian-Franco Kasper denied climate change and praised dictatorships, American snowboard and ski athletes are calling for his resignation. Olympic gold medalist Kikkan Randall announced Wednesday that she has been diagnosed with early-stage breast cancer. 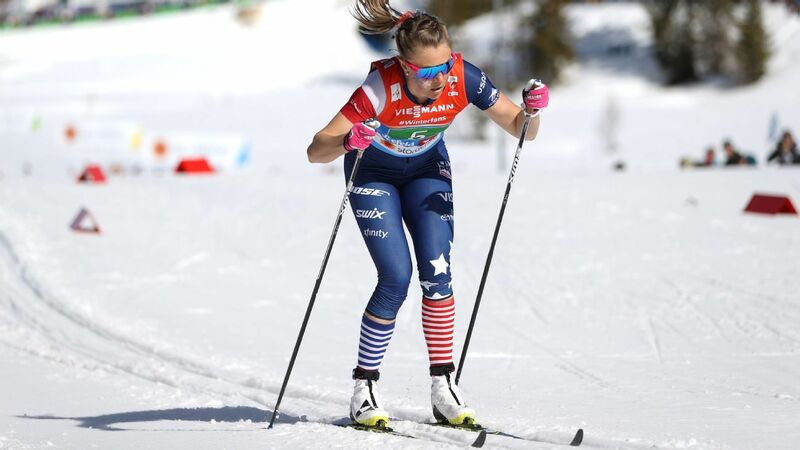 Olympic gold medalist Jessie Diggins breaks down that breathtaking (literally) team sprint win -- and the intense physical preparation that went into making it. Marit Bjoergen, the most decorated Winter Olympian in history, says she is retiring from cross-country skiing. Norway's Johannes Hoesflot Klaebo ended his strong sprint season in the cross-country World Cup with yet another win on Friday, while Sweden's Hanna Falk won the last women's race. Austrian cross-country skier Teresa Stadlober was well on her way to a silver medal at the Pyeongchang Games. Then came a mental hiccup that cost her a spot on the podium but earned her a place in Olympic history. Norway's Marit Bjoergen has closed out a remarkable Olympic cross-country skiing career in dominant fashion, winning the gold medal in the women's 30-kilometer mass start at the Pyeongchang Games. Miracurl on Ice! The U.S. men won gold in curling, snowboarder Kyle Mack grabbed silver and Gus Kenworthy found a new best friend. Here's what you missed from Day 15 of the Pyeongchang Games. Iivo Niskanen has captured Finland's first gold medal of the Pyeongchang Games. He beat out Russian Alexander Bolshunov with a strong sprint to the finish in the 50 kilometer mass start on Saturday. Jessie Diggins, who thrust herself across the finish line to give the Americans a dazzling gold medal in the cross-country team sprint, has been selected as the U.S. flagbearer for Sunday night's closing ceremony at the Pyeongchang Games. Just days before the end of the 2018 Winter Olympics, a couple of Russian athletes stole the show in women's figure skating, while the U.S. selected the person to lead the country in the closing ceremony. The United States has won its first Olympic gold medal in women's cross-country skiing, and Norwegian skier Marit Bjoergen is now the most decorated Winter Olympian of all time by taking bronze at the Pyeongchang Games. Marit Bjoergen helped the Norwegian women win the 4x5-kilometer cross-country relay on Saturday to take home her 13th career medal, tying her with Norwegian biathlete Ole Einar Bjoerndalen for the most Winter Games medals ever. Pita Taufatofua, the Tongan athlete who marched "shirtless" during the opening ceremonies, finished 114th in the cross-country skiing, 33 minutes behind gold medalist Dario Cologna. Switzerland's Dario Cologna has become the first cross-country skier to win three Olympic gold medals in the same event by capturing the 15-kilometer freestyle on Friday. One of only two Indians to qualify for the 2018 Winter Olympics, cross-country skier Jagdish Singh faced an obstacle course merely to get to Pyeongchang. Ragnhild Haga of Norway has won her first gold medal in the women's 10-kilometer freestyle at the Pyeongchang Olympics, dusting the field by more than 20 seconds. Johannes Hoesflot Klaebo and Stina Nilsson, who came into the Pyeongchang Olympics as the favorites in the cross-country skiing sprints, both won gold medals on Tuesday. From teenager Red Gerard's gold to a historic night at the luge track, we recap a busy Sunday from the Winter Olympics in Pyeongchang. Simen Hegstad Krueger crashed and fell on the first lap, and even that couldn't stop him from winning Olympic gold, as he completed an amazing comeback to win the men's 30-kilometer cross-country skiathlon Sunday at the Pyeongchang Games. Ireen Wust was part of yet another speedskating sweep by the Dutch, while American Maame Biney kept her hopes alive on the short track. We recap this, and more from Saturday at the Winter Olympics. Charlotte Kalla of Sweden won the first medal of the Pyeongchang Games on Saturday and Norwegian cross-country skier Marit Bjoergen took silver in the women's 15-kilometer skiathlon to become the most decorated female Winter Olympian ever. Pita Taufatofua didn't need a shirt for these Winter Olympics, even in frigid conditions, as he was bare-chested again when he carried the Tongan flag into the opener of the Winter Games in Pyeongchang on Friday.